Check this space regularly for our last minute or one-of-a-kind specials. Always great resorts, always great prices — look to Midwest Condo Vacation Rentals for Resort Lodging Accommodations and Holiday Rentals from the Great Plains to the Great Lakes. We also offer short notice deals, for check-ins 90 days or less from today, at our Last Call Travel website. See below for further information on these specials. We offer a condo vacation rental week in a two bedroom cottage. The unit sleeps 6 people, and features a full kitchen, a king bed in each bedroom, a queen sofa bed, and more (see list, below). Stormy Point Village is one of the highest rated Branson resorts on TripAdvisor and has earned a Certificate of Excellence. Regular rate for the 2BR condo is about $1400. Ours is a great Independence Day rate! At Stormy Point your two and three bedroom cottages are classic, contemporary, and luxurious in design. Each cottage features granite countertops, stainless steel appliances, plasma televisions, whirlpool baths and a private porch for relaxing in the fresh mountain air. Enjoy a “Twin Home” Fourth of July 2014 holiday rental at the Causeway on Gull Resort. 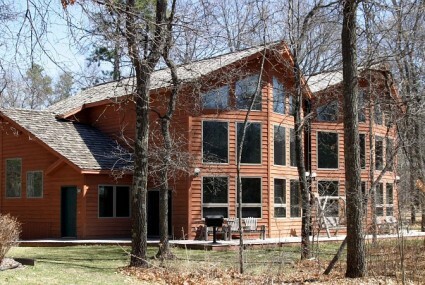 Condo sleeps up to 8 people, has 2 bathrooms, full kitchen, hot tub, and washer-dryer (most units). Featuring nearly 1,800 square feet of luxurious living space, this condo vacation rental boasts a living room with a 26 foot vaulted ceiling, a towering wall of windows to capture the spectacular views of the lake and surrounding woods, a massive stone fireplace, the finest in furnishings including a queen sofa sleeper in the living areas, plus a convenient wet bar. The spacious master bedroom suite features a queen bed, huge bathroom with a separate step-in tub, a shower designed for two, and an ample dressing area. The upstairs loft area provides a second private bedroom area with full bathroom, 2 twin beds and a queen sofabed. Step through the French doors of the master bedroom to the four-season porch, and soothe away your cares in the warmth of the bubbling hot tub. Click here to check availability or to pay for this condo vacation rental. Compare our rate with what you would pay if you book through the resort — you will expect to pay $2350 plus tax. Enjoy the 2013 Fourth of July holiday in a two bedroom Lodge Style Floor Plan condo vacation rental at the Silverleaf Seaside Resort. This 2BR lodging accommodation sleeps 6 people (king and queen bed, queen sofabed), provides 2 bathrooms, a full kitchen, and a deck or patio. 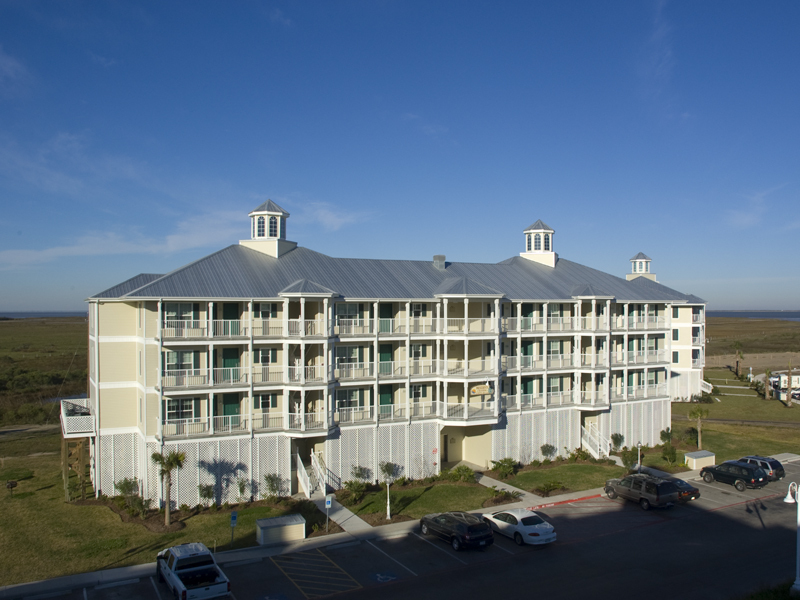 Silverleaf’s Seaside Resort is located on picturesque Galveston Island. The gentle surf, combined with sandy beaches and near-perfect weather year-round, make this resort a wonderful getaway. Antique lovers will enjoy the many quaint antique shops on the island. Galveston Island provides a variety of historical events and activities for all ages. Moody Gardens, 156 acres of educational and fun-filled activities for all ages. Visit a tropical rainforest, which features more than 1,700 species of tropical plants, fish, birds and butterflies; the IMAX 3-D theater and the white sands of the Palm Beach with freshwater lagoons and even a yellow submarine for the kids. The Moody Mansion has been restored to its turn-of-the century grandeur and depicts home life of an influential, powerful Texas family. Open daily to visitors, the mansion is filled with furnishings and personal effects of the Moody family. The Strand Historic District is located along Strand and Mechanic Streets between 20th and 25th Streets. This National Historic Landmark District has been renovated and contains a wonderful collection of 19th century ironfront buildings. Dickens on the Strand is a yearly event, held in December, where you can take a step back in time as the district recreates late 19th century living. Please visit Silverleaf’s website for more information, photos, etc. Please click here to check availability or rent this week.